Syfy’s Wynonna Earp fans (“Earpers”) learned the series will be returning for a third season during the show’s panel at the 2017 San Diego Comic Con. Showrunner/executive producer Emily Andras and the cast were a huge draw at the Con, taking part in a Q&A with fans while celebrating the series’ third season renewal. 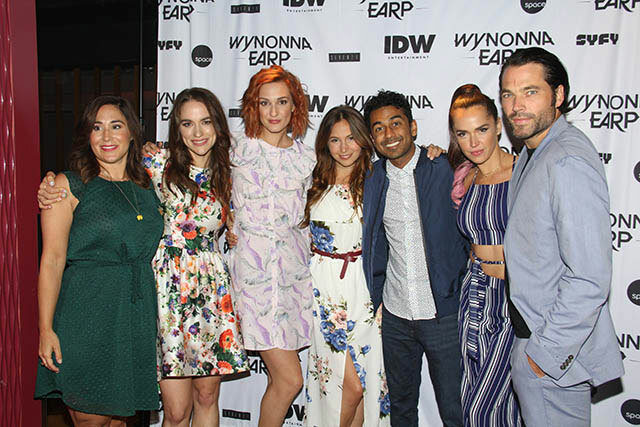 The cast, including Melanie Scrofano, Tim Rozon, Dominique Provost-Chalkley, Katherine Barrell, Shamier Anderson, Varun Saranga, and Tamara Duarte, also sat down for roundtable interviews during this year’s Con. Showrunner Andras explained the thought process behind Wynonna’s pregnancy reveal and writing interesting female characters during our interview at Comic Con. How do you manage to give everyone such deep storylines without letting any character fall behind? This is one of the best feminist sci-fi shows and you’re a feminist. How do approach that when you’re writing? I think genre as a rule is really inclusive. Since the time of Star Trek, certainly hopeful genre portrays a world that we want to live in, one that celebrates diversity and equality. So, I almost think it’s easier in genre to comment on that stuff. And, really, I didn’t pull any punches. When I pitched the show, I was like, ‘I want to do a Western but with all the traditional male characters as women.’ I don’t feel like I’ve tricked anybody. Can you talk about handling the pregnancy and keeping it a secret? Was the decision to make the pregnancy so quick always the plan to get her from point A to point B? Can we expect any surprise pairings by the end of this season? You really brought it in episode 7 (which aired July 21st). And we’ll be spending a little time exploring some backstories, too?